This is the 46th episode of CrossFit Radio, which aired at 6pm PDT on March 18th, 2009. USMC Maj. Andrew Thompson runs a unique military affiliate. After starting with one trainee, they commonly have over 40 participants per session. They do things very differently at CrossFit Quantico. All workouts are outside. They operate on a non-profit basis, meaning all access to trainers and equipment is free. Access is limited to: active duty military or retired military personnel, DoD civilians and contractors, CFHQ staff and others granted permission from the Maj. Their goal is to “exemplify the Marine Corps functional fitness concept and be an example for other military affiliates to emulate.” It is also interesting to note that they have two of their own Hero WODs. The next show will be Monday, March 23rd, 2009 at 6pm PDT. 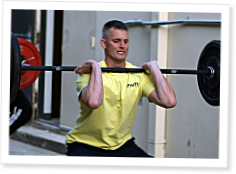 This is the ninth episode of CrossFit Radio, which aired at 8am PST on November 16th, 2008. This is the third episode of CrossFit Radio that aired 9AM PDT on October 5th, 2008. This is the 57th episode of CrossFit Radio, which aired at 6pm on Wednesday, April 15th, 2009.
so well spoken, great interview with a lot of good info covered. Truly a stand-up guy, proud to have him serving our country. We need more leaders like Major Thompson in the military. Very cool interview, Major Thompson looks like a great guy. This is awesome. I hope our military affiliate here in yuma,az works out just as well! Great interview! Coach Drew is the man! Thanks for another awesome show Neil. BTW, where did the radio blog go? is there a different link to it??? I had the pleasure of meeting "Drew" Thompson at the Crossfit Cert at BGI - West Palm Beach, FL. What you see is what you get! His energy and knowledge are incredible, so nice to see other people have taken notice too. A true leader, we're lucky to have him working with us. Andrew, thanks for the wonderful insight on Coach and Lauren's classes. That's a good point to hammer home that CrossFit doesn't need to be overly complex. Brutal couplets and triplets with conventional movements can elicit a great response. John Welbourn and Chuck Carswell: I know John was in the NFL and I think Chuck played high level ball as well. I'm very interested in how such elite football players have trained most of their life and how that compares with their CrossFit experience.